I am the Sixth of my kind. Out of the mist, a young woman appears. She is bald, has golden skin, wears silver chainmail, which is light and does not impede her movement and gracefully carries a two-handed sword. If the characters converse with her, she is pleasant enough but is confused about where she is and who she is. All she knows is that she is the Sixth of her kind. If the characters allow her, she will gladly join their group, sensing that she will be able to remember her past while she adventures with them. 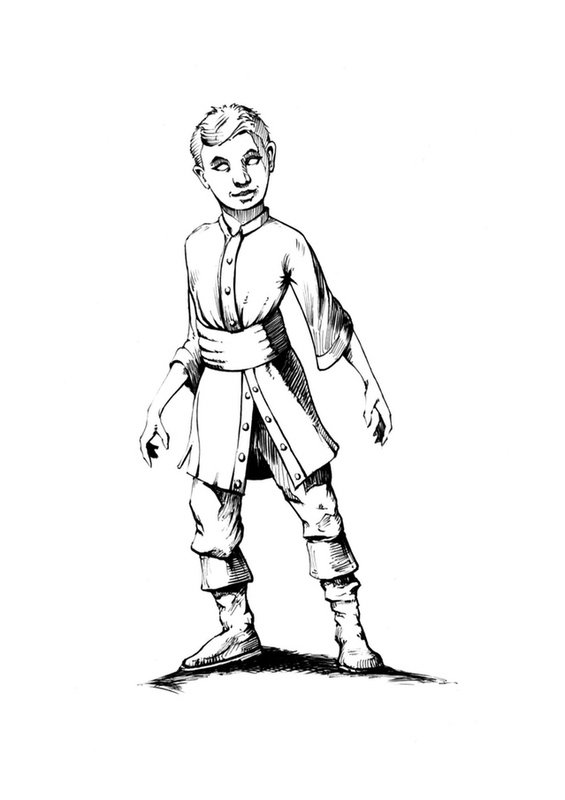 The Sixth is a magical clone of a former lover of the Sorcerer Ternon the Blind (see Crypts and Things page 137), and as her name suggests is the sixth in a series of failed experiments. Her ‘sisters’ are abroad in the world and may be encountered as she adventures with the party. Unlike her, they are all physically or mentally deformed in some way. They have the same stats. They hate her and want her dead. When they encounter her, they will challenge her on one to one combat. Once the other five are defeated, Ternon appears to bring the Sixth home, telling her that he released her into the world that to kill her five sisters. Only she could remove these abominations since of all of them she was the only perfect one. She then returns willingly with him. Ternon magically created her to be stronger and faster than normal humans. Therefore she has a +3 to hit and damage with her two-handed Sword, has a move of 15 (rather than 12) and -4 [+4] modified Armour Class. The Sixth AC 1  Chainmail HD 6 HP 36 Attacks 1 Two-Handed Sword (1d10+3, +3 to hit) Move 15 Special Rules: Especially fast moving, Superhuman Strength, Immune to Sleep and other mind control magics CL/XP 7/600. 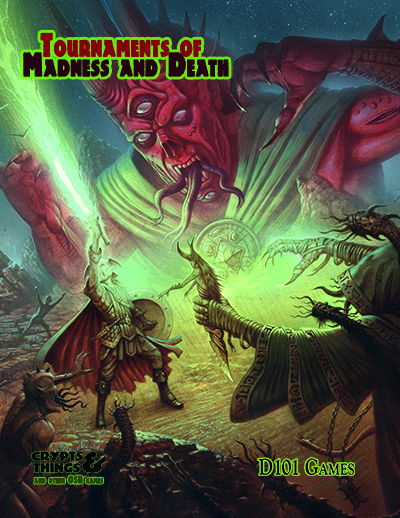 Its Fiendish Friday, so here’s my final preview of the upcoming Life and Death Zarth Edition scenario book, which is currently on pre-order and out on general release next week. In a nutshell Life and Death is my attempt at doing a post-apocalyptic fantasy world in the style of George Romero’s Day of the Dead films with a large dollop of Clark Ashton’s bleak take on Swords and Sorcery. 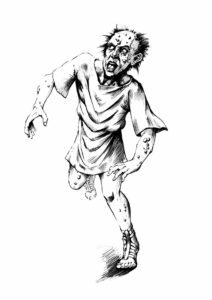 Except with me being all Fighting Fantasy “You are the Hero”, the players have the opportunity if they dig deep enough into the adventure to find out why the world is full of shambling undead. L&D was originally a D100 adventure for OpenQuest and specifically, my attempt at making an open-ended adventure where the players could still make choices and drive the plot depending on them. I wrote about this in a post I made to support the OpenQuest Bundle of Holding and the Crypts & Things conversion still holds that structure. It’s not a dungeon crawl, but more a location based adventure where each location is described in broad terms, enough to get the GM going and answer basic questions, a list of who is to be found there and then a series of events that could happen there if the appropriate triggers are satisfied. It’s a sort of story based sandbox. I give you the blocks and the players actions put them together. I’ve run the scenarios multiple times and no run is the same. Joining the Guild of Treasure Hunters. This is a one-page mini-adventure. It’s a tribute to the sort of introductory adventures you got in old RQ2 campaign boxes, such as Entering Pavis, where the title reflects exactly what happens in this straightforward adventure. Sit down and play through the adventure and let your players basics of the rules and ease them and yourself into the setting. This adventure gets the player characters signed up the Guild, which gives them a rationale for working together and a ready-made patron for the adventures ahead, who isn’t some bloke they’ve met down a tavern or a high-level character who has a vice like hold over them. The Dust of Eternity. This my take on the traditional sorcerer’s tower adventure, with Zombies as the main protagonist. I made sure that every NPC and monster in the adventure is a person with a personality and rationale behind their action. A lot of this came from the “Monsters are People too” articles from back in the 80s. Those short essays that held the central realisation that NPCs weren’t just stat-blocks waiting to be hacked apart, but had personalities and motives just like the characters! 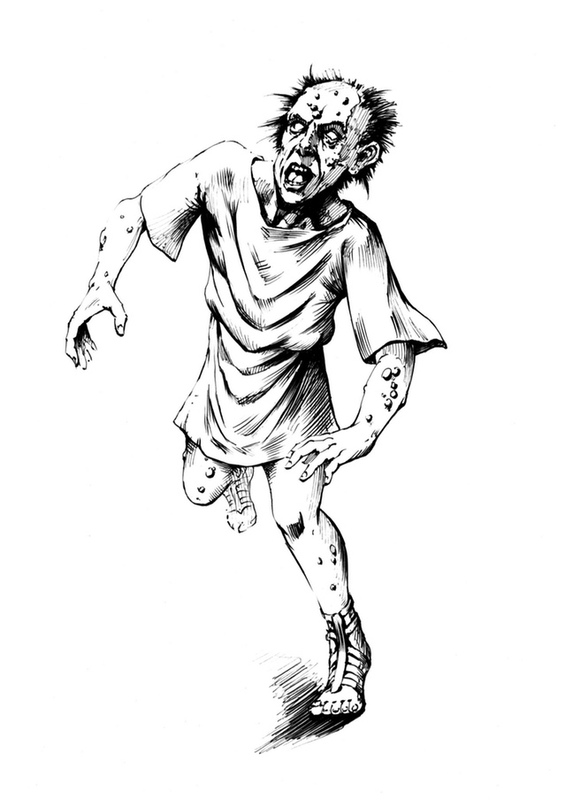 Another inspiration came from playing far too much of the first-person shooter Bioshock, where the zombie like antagonists wander around moaning and streaking about things to do with their previous life, which brings about a weird morbid fascination that even these monsters have feelings and thoughts which deepens the sense of horror. I also wanted to write an adventure where the players don’t win if they fight their way through and just collect treasure. Dead Pot Country. This is a small location based setting. The characters are lured there for a number of reasons, a breakdown of which is given in the setup of the adventure. On the edge of the dried-up valley that dominates Dead Pot country itself is the village. Things are not happy in the village. Bandit chief and his men have taken over the village and have forced them to look for relics of the ancient dead civilisation that used to flourish in the area. Will the characters help the villagers break free or will they side with the Bandits for quick and easy access to the valley? Once in the valley, the characters must navigate the cyclopean ruins of the dead river civilisation which is haunted by gangs of undead monsters and guardians. Finally, they find their way down into a dark underground labyrinth were rulers of Dead Pot Country wait for them in the darkness. Life and Death. This is the truly epic adventure of the book, which is served up in four parts. It’s like a film in three acts. The first act sees the characters arrive in the village outside the gates of Miraz, a militaristic city state. During this act, we learn the character’s motives for coming here. Perhaps they are here to make their fortune as a mercenary, rescue a loved one or seek to help destabilise this tyrannical city which is currently suffering from a plague. They spend a night in a “hostel for visitors” since the gates are closed until morning. This allows them to experience Miraz’s culture first time, and prepare them for the state of fear and suspicion they will encounter inside the city. Then the second act focuses on what is happening in the city. It gives a rundown of the city’s culture, the current situation where one-third of the city is overrun by a Zombie plague, a guide to the city’s main locations, with events that can happen there, and a cast list of everyday citizens and various movers and shakers. The last act takes them high into nearby mountains where the source of the city’s power, an iron mine, is the centre of a struggle between three factions seeking to control the destiny. There deep in the mine system the characters finally come in to contact with the enigmatic force that will decide the fate of their world itself. The final part of the adventure is a section about how to bring the adventure to a satisfying conclusion for the players, no matter what rambling route they have taken around it. 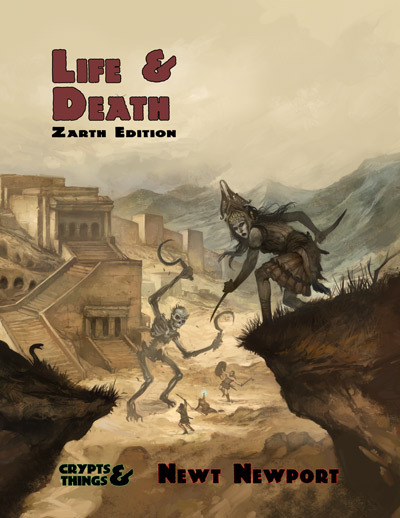 Life and Death Zarth Edition is currently on Pre-Order on the D101 Games webstore and will be available by the end of next week. Buy Life and Death on Pre-order via the D101 Games webstore. So here we go, hot on the heels of the main rule book comes this short, fun A5 zine, which is currently in layout. Achievements. A short system that sits alongside the experience system to reward characters for things they have done in their adventures, making them memorable events and useful benefits. The Secret of Skull Hill. A short adventure of mystery and otherworldly delights featuring the schemes of an alien parasitic race and their attempts to reunite the body and soul of their host god. By their Master’s Dark Command. The sad and short lives of Sorcerer’s apprentices revealed, and the useful things they become after death detailed. Exotic Liquid Relief by Neil Shaw. Is your character bored with quaffing bog standard Blackmire’s Best whenever they need to regenerate 1d6 Hit Points? Well Neil Shaw provides details of a variety of brews to make your character’s life more varied and interesting. Generic Life Events. This table is if you are overwhelmed by the sheer number of Life Event tables in the main rule book or simply after a OGL version you can base your own efforts off. Useful Items of the Kindly Ones. Minor magical items left behind by the gods who used to care about Zarth. Tea Party of Doom. A short encounter somewhere in the dark dismal woods with a crazy immortal Alchemist who has been playing with the psychoactive toads and their potential to provide tea. Most of Crypts and Things literary, comic and gaming influences are listed in the bibliography in the book but here’s some of the films that inspired me during the writing of the book. Anything by Ray Harryhausen, especially Jason and The Argonauts. Don’t know about you but my skeletons are like this. Warlords of Atlantis, for all those lost cities under the ocean ruled by strange Sorcerer’s and their hybrid monsters. Hammers’ ‘She’ for the ultimate of Sorceress ruling a lost city in the jungle vibe. 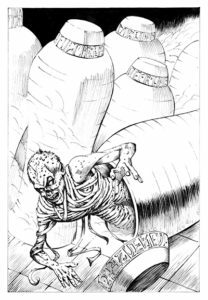 and while we are drifting off down the horror side, Clive Barker’s Hellraiser and Nightbreed provided me with lots of inspiration for the demonic Others of the game, and hey the Puzzle Box (along with Elric’s Stormbringer) is the epitome of a C&T magic item. finally the inspiration for the ghostly netherworld of the Shroud comes from the film Nightwatch (which I saw before I read the excellent novels upon which it is based upon). If you are wondering if there is a the connection between the leaders of Serpent Men, The Mara, and the Dr Who episodes Kinda/Snakedance this trailer for the DVD release should confirm it. Once upon a time in alien Other World there was a God called Ugsharak. As a deity that lived outside of time and space, he could be called upon to provide magical knowledge and power. Ugsharak was served by a race known as the Gizoni, who in return for blood sacrifice received potent black magic from the god. When he took form in the world it was as a monstrous 30 foot tall giant skeleton whom the Gizoni called the “God Who Walks in Bone”. Over a span of a thousand years the Gizoni home world weakened and became a desolation because of the constant need for blood for Ugsharak. In response Ugsharak decided to leave, gathering his priesthood into his mouth and traveling to a new world to start the cycle of pain and suffering again. Upon reaching the world of Zarth he materialised there in his physical form. However disaster awaited him. His body materialised in the earth, an element abhorrent to him, and he became trapped in rock up to his neck. His soul escaped to a place in the Shroud helped by a the Gizoni. In time the Gizoni priests, made a bridge via an ancient crystal Black Monolith not far from his body, which had now fossilised and with only the skull above the earth. Thus the legend of Skull Hill was born. In time humans settled nearby, refugees from one of Zarth’s devastating wars. They were simple farmers and a superstitious lot. When they found the Black Monolith at the edge of their lands, they started leaving some of their crops as an offering at Harvest time. One day the Gizoni came out from behind it, as they had gated over from the Shroud to make sure the Zarth end of the portal was still intact as was their wont from time to time. The locals prostrated themselves before these new gods and soon they were providing human sacrifices to the Gizoni at ‘Harvest Time’ who would take them to the slumbering Ugsharak in the Shroud. Tragically though within a couple of generations the nearby human settlements were deserted due the strain put on their populations due to the annual sacrifices demanded by the Gizoni to reunite their god’s soul with its body. Not only was it tragic for the local humans, whose lands became the deserted Lonely Place, but for the Gizoni who were only a few sacrifices away from having enough stored magic reuniting their god’s soul with its body and freeing it from the hill. To be continued in the “The Secret of Skull Hill”. 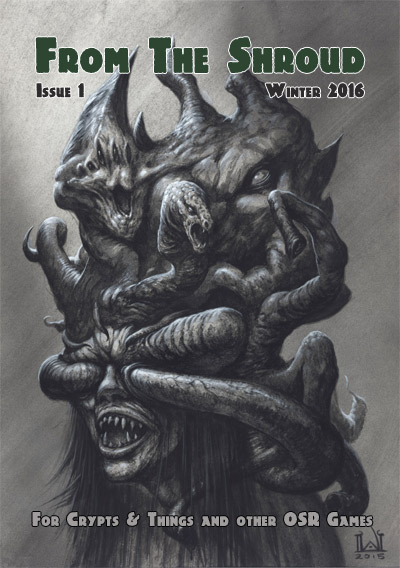 An adventure in From the Shroud #1 eta December 2016. From the upcoming Crypts & Things, I present the Serpentstory of the early rise and origin of Zarth’s Serpent Men. The Serpent Men have their beginnings in a group of Lizard People known as the Mara. In Ancient times this small enclave of magicians was tasked with experimenting with powerful magics that dealt with the enhancement of the natural world around them, in a place far away from the main Lizard People nests for safety’s sake. Already remote and cut off they were further isolated when a magical disaster raised the waters around their nest-complex and broke the land into rough mountainous terrain. Once the survivors dusted themselves down and collectively rejected the idea that they were in any way shape or form responsible for the disaster, they found they had the ideal environment to carry on their questionable magical experiments. Without any moral restraint or condescending ethical disapproval from the rest of their race they quickly discovered Black Magic and became tainted by the use. Because they were few in number – developed Vivimancy to enhance their own genetics, taking a serpentine form and completing their separation from the Lizard People. Later they would further developed this blasphemous form of magic to twist and hybridise other creatures, leading to the creation of other servitor races. The Mara also found that the disaster, which they now saw as a blessing from the Dark Powers, had also opened many portals to hellish Other Worlds in theirbroken land. Contact with the Others, both Minor and Great, gave them access to more Black Magic. When they started gradual expansion into the lands around their immediate sphere of influence employing the corruption of the Dark Arts this soon led them into conflict with the Lizard People. Recently I wrote the City Adventure chapter of Crypts and Things Remastered, which centres on the Demonic Pirate city of Port Blackmire. I wrote it pretty much in a couple of intense sittings, and after completing it I reflected on where it had come from. Magnificently vast ancient crumbling cities are such a staple of the Swords and Sorcery Genre that they become characters in their own right. They are the back drop to many a caper, such as magical heists, murder stories, clashes with dark robed cultists who have set up murderous shop just down the road from the character’s local tavern. With this in mind I present Port Blackmire, a city straight out of the British Grimdark tradition of the 1980s, of dangerous city states where all residences within the city walls are trapped to keep out not only the thieves but the dark things that prowl the streets, either openly or in human disguise, and the city’s ruler is the most evil thing in the city. A place where even the good pay tribute to the city’s vile old temples to keep misfortune from their door. This is the playground for the characters, whether they are blowing their misbegotten gains in the taverns on grog or on some high stakes game of chance or earning some extra coin by locating missing persons or burgling some fool with more money than sense. Sometimes it’s the place where adventure comes straight at them, dragging them out of their comfy beds when they most need to rest up and heal from their last venture. Much of the inspiration came from the Fighting Fantasy books of the 80s and their spritual descendants, the pages of White Dwarf Magazine and Warhammer Fantasy Roleplay First Edition. Port Blacksand (City of Thieves) – was a principle inspiration, heck the name is a clue here 😉 Black Sand is the star of the Fighting Fantasy book City of Thieves, a character in its own right, a dangerous port controlled by a mysterious Pirate Captain Lord Azzur. The place is filled with traps and monsters, and is an active risk to the heros life. 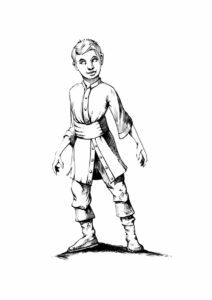 Khare (Sorcery book 2:Cityport of Traps) – My memories of Khare are slightly less well defined, but it carried on the theme of the Dangerous City as a character in its own right. Here the traps of the title are set by the Lawful members of the city to stop their Chaotic neighbours from helping thierselves to their treasures. 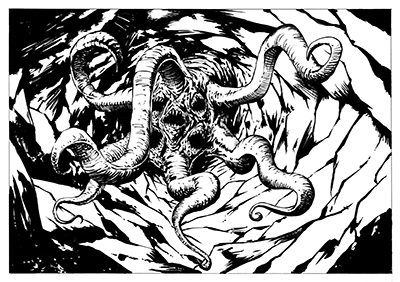 Irilian (White Dwarf 42-47, Best of White Dwarf Scenarios III). This high medieval city state in decline is the star of a 3 issue mega scenario from the early days of White Dwarf. So much detail was crammed into it that they used a slightly smaller font to keep to the alloted page count. The city, orginally rich from the jem trade, is well past its best. Yet it has all the Guilds, Temples and monestries from its hayday. It’s state of social torpor makes it the target of attack from ancient evil, that is more an impersonal force in the tradition of Susan Cooper’s Dark is Rising Trilogy. In fact its the city and its institutions, possesed by this force, that is the opponent in the scenario. Middenheim (Warhammer 1st Ed, City of Chaos). On the surface of it Middenheim is a massively bigger rerun of Irilian set in the Warhammer Fantasy Old World. Its a high medieval city undersiege by the forces of Chaos and the players must interact with the city’s instituions and power players to win the day. What makes Middenheim interesting is that it focuses on Politics as well as the nitty gritty of the city encounters. That and the scale of the city, which magificiently sits atop a mountain with a flat top rising up from the forest floor. Fiendish Friday: Come Visit Bloodstead and Die! 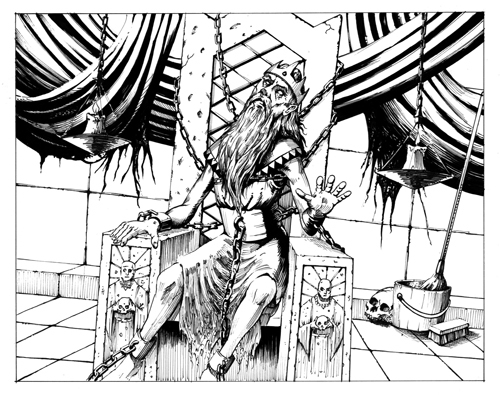 An excerpt from the upcoming Crypts and Things Remastered ( latest update on progress on kickstarter), which is part of the Crypt Keeper’s Secrets of the Contient of Terror chapter. The power base of the Sorceress Rula and her berserker followers. At first a typical Wolf barbarian city , with long houses, drying fish nets, until you notice all the dead bodies hanging from masts, skulls and heads on stakes, and red banners hanging above every building entrance. Rula claims to be the Wolf Mother come to Zarth in a bloody form,”the Red Wolf Mother”, seeking to purge the unclean and destroy Khaos once and for all, but in reality in secret she and her followers are devotees of the Blood Throne. Sneak into the city and out again to rescue people taken as slaves in a recent Blood Berserker raid. Two seasons ago a local Chief from Longren was killed by Blood Berserkers and his head taken by them. The characters are hired to regain the dead chief’s head ball, which is now being used as a drinking cup by the war leader of the Berserkers. Find out what is really going on In the Temple of the Red Wolf Mother, so the priestesses of the Wolf Mother temple in Longren and Bulwulf can stop arguing amongst themselves and unite against Rula and her followers. 1-8 One of the Berserkers, backed up with 2d6 of their mates, comes up to the characters and starts a fight. 15-18 A Blood Priest asks the characters to causally go and murder someone (50% of being an errant Berserker who has threatened the Priest) saying that it will bring them great glory with Rula the Red Wolf Mother. 19-20 Rula appears in public to whip the population into a blood-letting frenzy, in advance of some great raid against the city’s enemies or a magical ceremony to summon a Greater Other.